I have been with Boyer for a very long time. Everyone there knows what they are doing and always are there to help you. 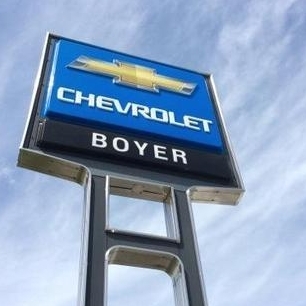 Have never had a bad experience while dealing with the Boyer team. Fast and friendly service as always. They are a great team to deal with. They saved me money with the service promotions too. Fast , friendly, professional service. Nothing more to say. Will have you service my vehicle again when the next service check is due. I had a fairly serious issue with the brakes on my truck. I was terrified that it was going to cost me a fortune. I spoke to the service manager, he was fabulous. We spoke about the issue I was having and he said my warrantee covered that issue. We set a date to bring my truck in and they lent me a car for the day. I bought my first brand new vehicle from Boyer Lindsay and I can honestly say that I will never go anywhere else. The staff there are very kind and treat their customers better than any dealership, store or wherever else I go to spend my money. Staff are always great at Boyers, from the receptionist who answers the phone to the courtesy car driver. Have never had a bad experience with the service department. Service was done 90 minutes after appointment time! They said they were running behing schedule and I missed an important appointment.